'Thakurbari' means Rabindranath Tagore's home, which is situated at Jorashanko, Kolkata. Tagore's family is popular for many things and one of them is 'cooking'. Nowadays, you can watch plenty of cooking programmes in TV, but when I was in school, only few magazines used to publish cooking recipes on weekends only. The craze was also different in that time. I still can remember how my mom and grandma used to eagerly waited for these kind of magazine recipes. 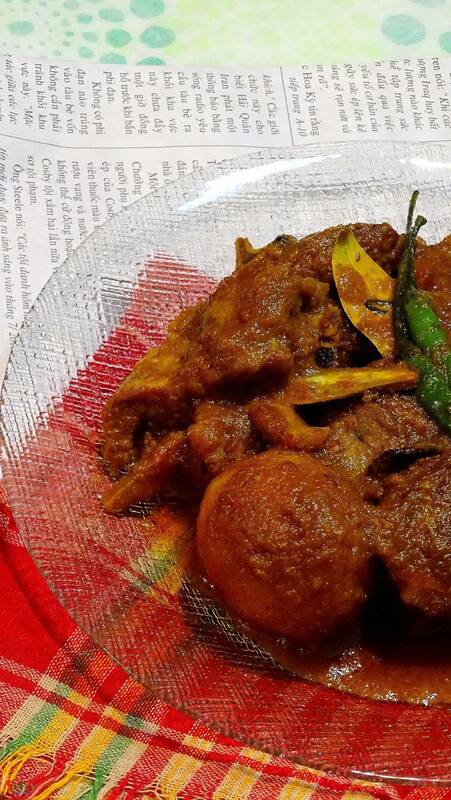 Among them, one of the popular item was 'Thakurbarir Kosha Mangsho', secret recipe of their family. 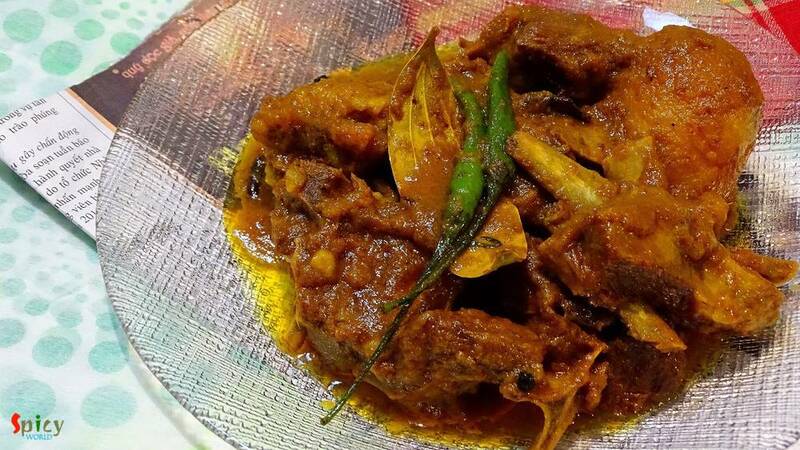 I am not telling you that there is a huge difference between normal mutton kosha and this one, they also told the usual process but with some slight twists. These twists will make the dish more unique and delicious. Try this in your kitchen and enjoy a lovely meal with your family. 10 to 12 with bone mutton pieces. 1 potato, cut into half. Spice powder (1 Teaspoon turmeric powder, 1 Teaspoon red chilli powder, 1 Teaspoon of roasted cumin and coriander powder). 2 to 3 green chilies. Whole spices (1 bay leaf, 5 cloves, 4 green cardamoms, 3 - 4 black pepper corns, 1 small cinnamon stick). 4-5 Tablespoons of mustard oil. Make a smooth paste of onion slices, garlic and ginger with little water. Add 1 Teaspoon of sugar in hot oil and caramalize it. Then add the paste of onion, ginger and garlic in that oil. Cook for 10 minutes in medium flame. Add chopped tomatoes and pinch of salt. Cook for another 3-4 minutes. When the oil starts separating add all the spice powder and enough salt. Mix well for 3 minutes. Its time to add the mutton pieces. Mix everything in high flame for 5 minutes, then lower the heat and cook for 15 minutes. Mutton will release lots of water. Add the potatoes and half cup of warm water. Mix well and cook untill they all become soft. After that heat 1 Teaspoon oil / ghee in another pan. Add all the whole spices in that hot oil / ghee. Saute for 30 seconds and turn off the heat. 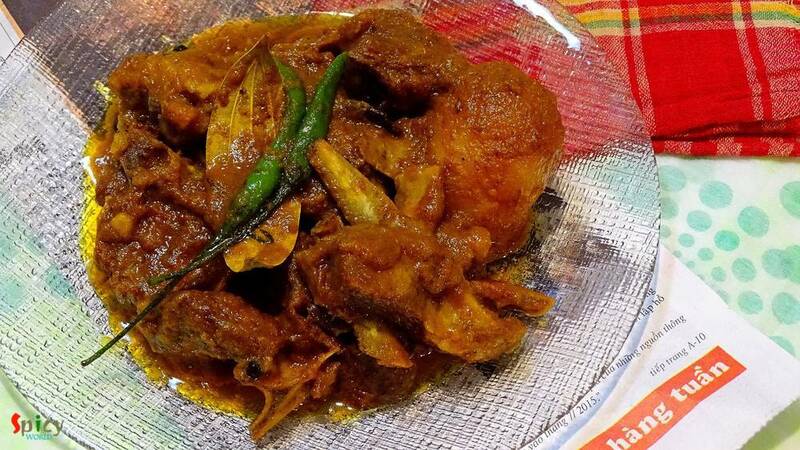 Now immediately add that oil with whole spices to the fully cooked mutton curry. Also add green chilies and simmer for 4-5 minutes with lid. Then turn off the heat, let it rest for 5 minutes and then seve. Enjoy this hot with some steamed rice or plain roti.